Time to mark a change from my usual concerns with careful and sustainable consumption. Over the past couple of months, I have had the good fortune to immerse myself in the world of luxury – and for once, it was not simply vicarious immersion. I got the chance to experience the lifestyle. I stepped foot in some of the most exclusive suites in top London hotels, where staying the night would set you back quite a few thousand; I had extravagant lunches followed by cocktails in the most desirable spots of the city. Those experiences were so interesting (please note that I did not just descend into oblivious hedonism) that I will follow up with a further dedicated post. However, back to the delectable luxuries I encountered in the travels and travails of my research. Luxury is about extremes – or actually rather, being the absolute best (luxury does not countenance being compared to other base things). This means it isn’t hard to find lots of rather silly but entertaining examples of products and services. They are deliberately meant to tickle our imagination. Or how about a nibble from the world’s most expensive cupcake? It was made in Le Dolci bakery in Toronto on the request of a customer who wanted something extravagant for his wife’s birthday. Well, what makes it so special and justifies the $900 price tag? A clue is in the list of ingredients: Kona Blue Mountain coffee, sea salt from the Camargue, organic cane sugar, Valrhona cocoa powder, Tahitian vanilla beans, pastry cream made with Krug Collection Brut champagne, Rosewood Estate honey, Normandy butter, Amadei Italian chocolate, 24-karat gold dust and leaves, and a limited edition Courvoisier. 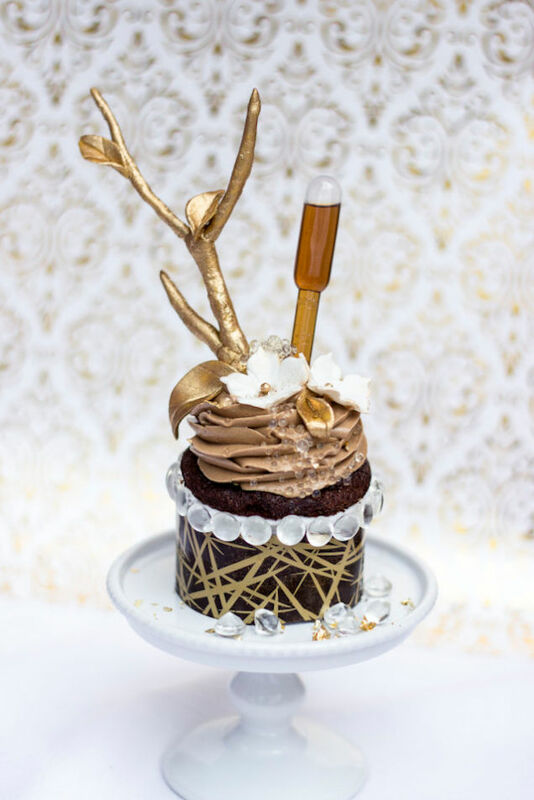 And here is the official product description: ‘The cupcake sits in a hand-made, edible chocolate cup garnished with crunchy edible pearls and dusted with 24-karat gold flakes. It is adorned with a edible gold-painted branch with leaves, fondant flowers edged in gold, edible sugar diamonds and delicate hand made champagne caviar bubbles.’ Lovely. “The creation of Grey Goose vodka begins with the finest soft winter wheat grown by three local farming cooperatives in the Picardy region of France. Only the highest grade of wheat, ‘Blé Panifiable Supérieur’- is selected– the same grade used in the finest French breads and pastries. Now I hope you will look at the clear tasteless liquid that is vodka with fresh eyes. Image via Le Dolci Bakery.